Descending into the inky darkness of the night to experience the nocturnal underwater world can certainly be a surreal experience. Many new divers find the thought of diving at night rather scary. However, for the well informed, diving at night can be one of the most relaxing, sensory dive experiences. Witnessing the creatures of the night and the different behaviours of animals after dark is a real privilege. If you are new to diving or perhaps you have never completed a night dive before, check out our night diving tips to ensure you get the most out of your night diving. Make sure you dive a site that you have dived previously during the day. This will not only ensure that you are familiar with the area and how to navigate it, but it will also mean that you will get to experience the unique transitional changes in the marine life and their behaviours on a site between day and night. On your first night dive, make sure you get ready in good time. There is nothing worse than rushing around at the last minute for unnecessary added stress, so allow yourself plenty time to get ready, set up your equipment and do your checks. Not only is the twilight time less intimidating for a first time night diver, it is also one of our favourite times to dive. At twilight, you will get to experience the change in creature behaviour from day to night and as a result it is often a very “busy” time in terms of animal behaviour. Day time creatures will be settling into position for the night, whilst the night-time creatures such as crustaceans, rays and sharks will start to become more active, preparing to commence their night time hunting. It is recommended that each diver carries a primary light source (their main torch) and a back-up light. The back-up light is used in case of primary light failure and can be a smaller torch or a even a glow stick. If your primary light does fail, don’t panic. Even with no light at all, it is amazing how much you can see on a night dive once your eyes adjust, especially if it is a full moon. Diving with the light turned off completely is often our favourite way to dive at night! You really do not need to venture very far on a night dive to experience the dive, so slow down. As many of the smaller invertebrate critters come out at night, slowing down will ensure that you get to see them. Keep your navigation simple to avoid disorientation and loss of direction. A simple out there and back navigation pattern works well and avoids the added stress of a complex navigation course. Whilst ensuring that you maintain close buddy contact on your night dive, do give your buddy a little space. It is actually quite difficult to get lost on a night dive with the torch beams, so spread out a little. There is nothing worse than buddies on top of one another and kicking each other’s masks and regulators out on a night dive so give each other a safe amount of space for a more relaxed experience, especially when diving in a group. Certainly for your first night diving experience, and until you are familiar with night diving procedures, it’s a good idea to go guided. Listen to the dive briefing and ensure that you are familiar with the briefed procedures for night diving and/or procedures that may be unique to the area. These should include night dive specific hand signals, night diving etiquete such as not shining your torch in other divers eyes, having respect for sleeping creatures, emergency procedures and so on. Just as divers do not like to have torches shone in their eyes, neither do marine life! As always, be a responsible diver, do not disturb or cause unnecessary stress to the marine life via your night diving behaviour. Many fishes use the night time to sleep or may exhibit unique nocturnal behaviour. For instance, parrotfish often surround themselves in a scent-proof cocoon of secreted mucous to avoid detection by sharks; Turtles lower their heart rate down to just a few beats per minute to allow them to sleep without having to return to the surface to breathe. Disturbance from divers’ lights being shone in the sleeping animals eyes may cause confusion, stress, disorientation, an increase in heart rate and so on. It is still possible to observe the animals via shining the light source off the animal to illuminate but reduce the level of stress from a direct torch beam so please be responsible. This is certainly the case with sharks who often get startled by torch beams and may end up swimming directly towards the light source! Many divers have an over-imaginative brain at night and worry about the potential monsters of the dark. Try and relax and ‘switch your brain off’ from these thoughts. And if you don’t like night diving at first, give it some time. 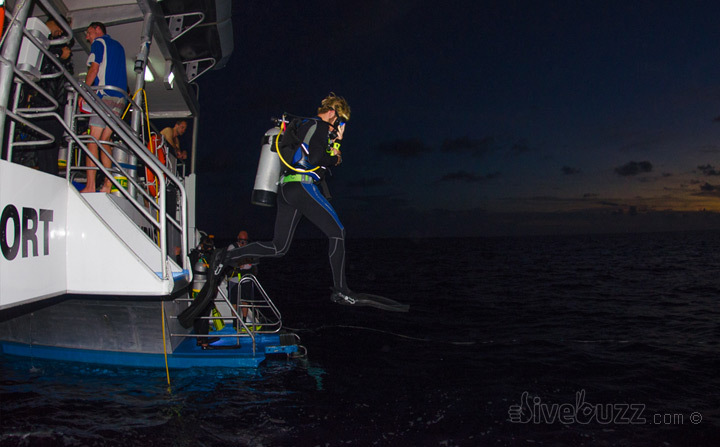 Overcoming your fears of the dark will be worth it to experience the often unique events of diving at night. So what are you waiting for? Get ready to dive in to night diving to experience a whole new underwater world. Do you have any night diving experiences or tips you would like to share? We would love to hear from you.